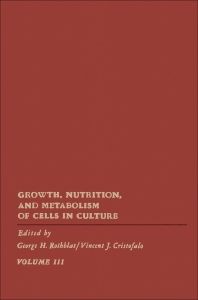 Growth, Nutrition, and Metabolism of Cells in Culture, Volume 3, focuses on a number of specific, timely areas of research that make use of cell and tissue culture. The major theme of this volume is growth and its regulation in animal cells. The book includes studies on the role of growth factors in cell culture systems; the effects of cyclic nucleotides in cell proliferation in culture; metabolic regulation during the cell cycle; and the role of the cell surface in growth and metabolic regulation. There are also separate chapters on aspects of abnormal cell growth and metabolism; DNA repair; genetic analysis using cell fusion techniques; the growth of vascular cells in culture for atherosclerosis research; the culture of haploid vertebrate cells for genetic analysis of cell function; data on haploid cell culture; and the value of using cell cultures to test for the possible toxicity of various pharmacologic agents.